As a mother now in addition to being a woman and wife, I have often thought about the process of getting things done. Everything is a series of steps to reach a destination or to finish a task. At least, that’s what goes through my head when my husband Justin and I travel with the kids. Without these steps, I don’t think we would leave Surry Hills very often. Or we would be a walking disaster whenever we left the house. 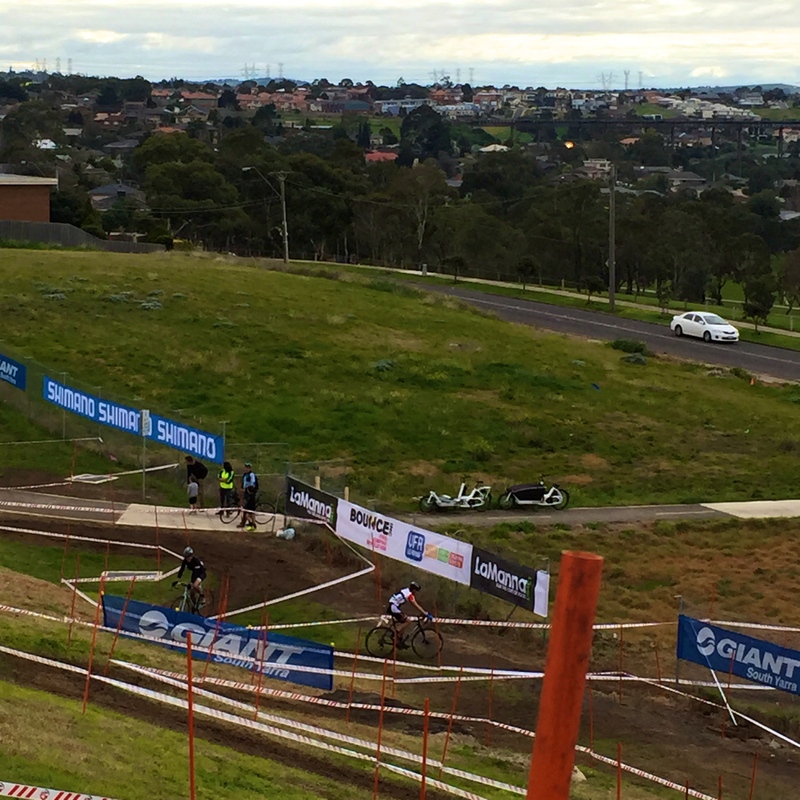 We were in Melbourne the other weekend for the Cyclocross National Championships. Justin joined me with the kids a day after I landed in Melbourne. I had enjoyed the previous day alone in bed with a cold after a few meetings. Fortunately, I felt a bit better on Saturday morning after a great night of sleep. 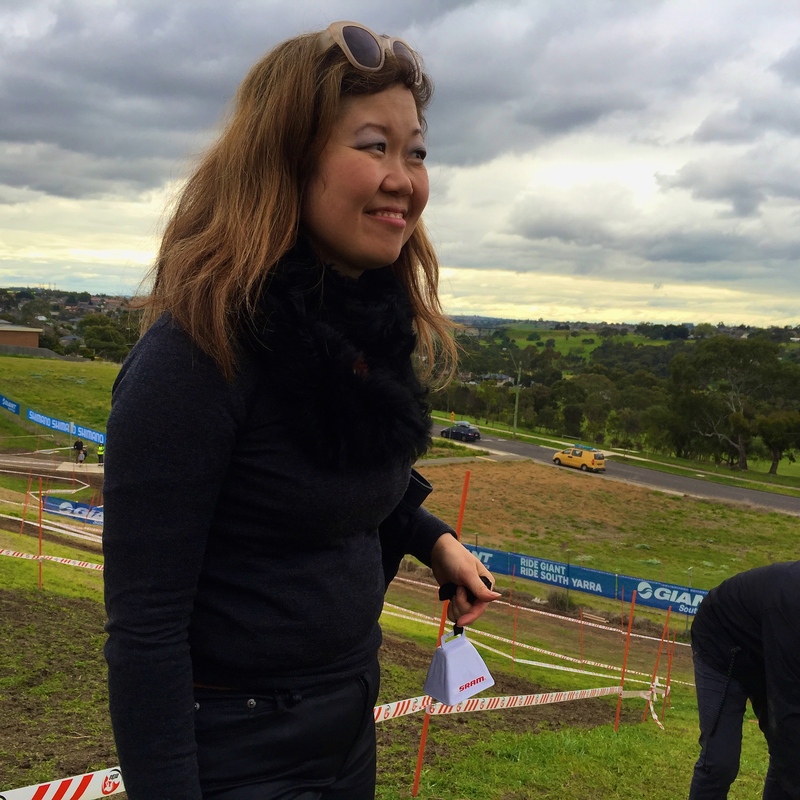 Today’s task was to reach the Fields of Joy cyclocross track in Strathmore, Victoria by 11am. Breakfast in shifts at the tiny dining table. 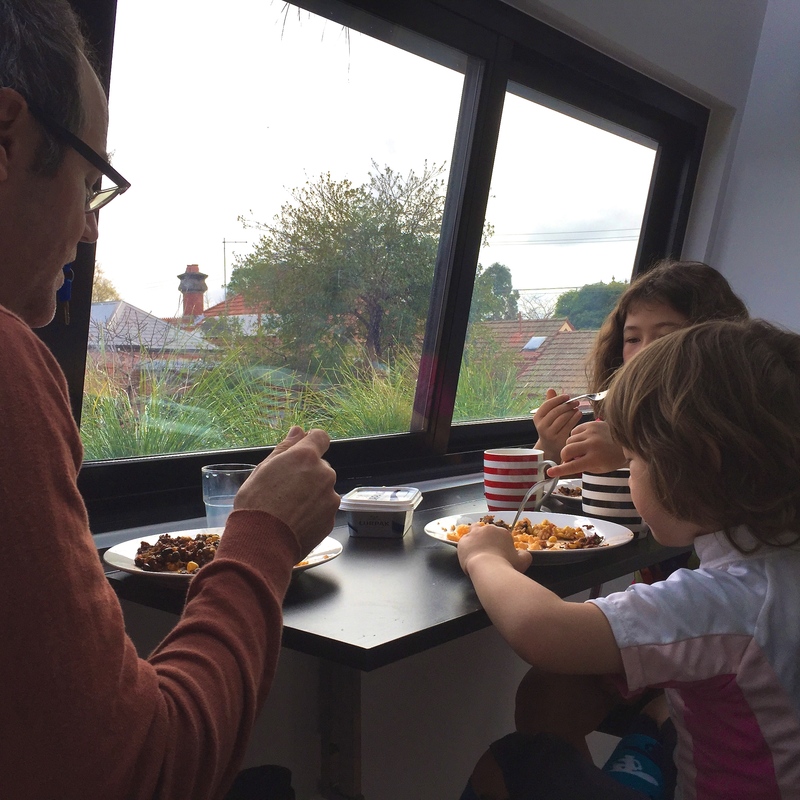 Is eating together at table a thing of the past? Justin had assembled the bicycles the night before. After breakfast, he attached them to the Urban Arrow – Bikes via the Thule mounts that Gary at Spokes had kindly assembled for us. 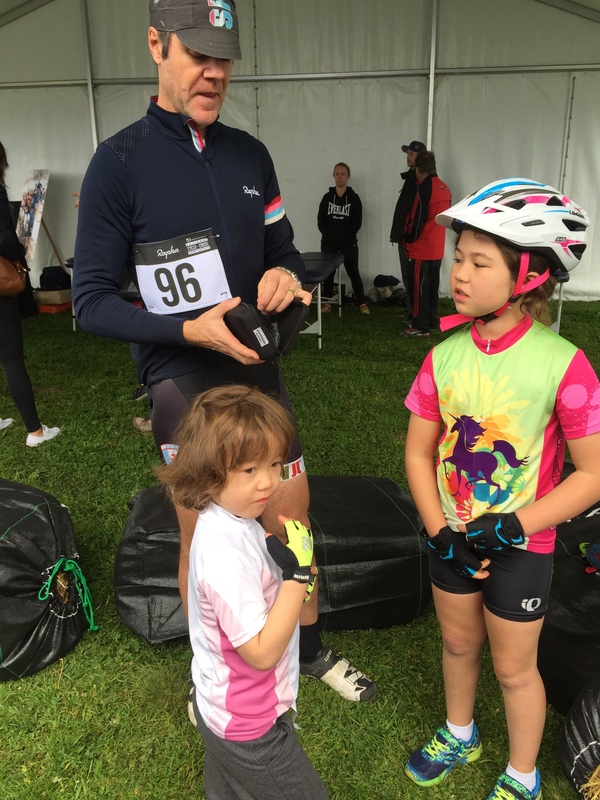 The kids were dressed warmly with lycra as the base layer for their races. We had charged the Urban Arrows’ batteries overnight. One last toilet visit and we were were off. Our friend Stephen had offered to be our guide to make our way there. Getting ready to go takes time and patience. First stop was the grocery store to buy some food for the day. Because we were cycling there and back and the kids and Justin were racing, we needed to make sure we had enough energy to return. I asked Stephen to think about the shop that would be on our way to the route he had in mind. Armed with provisions and narrowly avoiding the cars in the parking lot, we set off again. The kids know to be patient while we prepare to leave. Ofelia brought her math workbook along for the weekend. 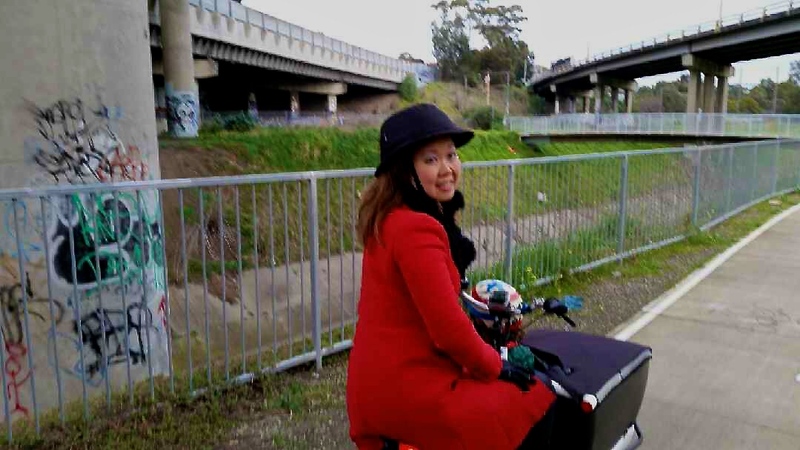 We took the bicycle path that follows Moonee Ponds Creek. There were a few hairpin turns along the way. 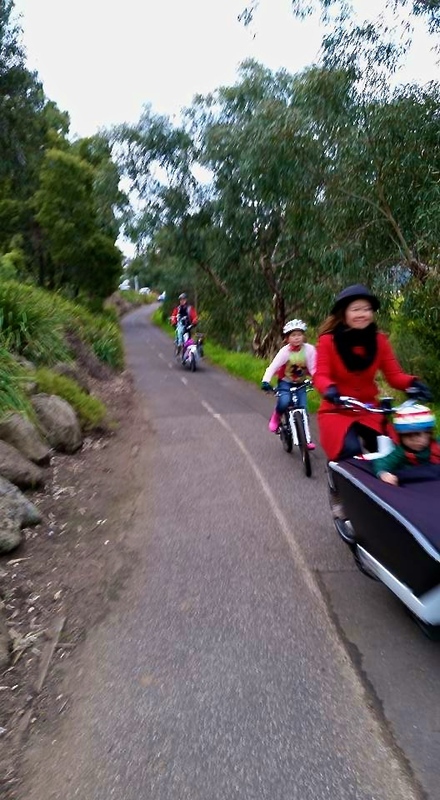 At one point, we unloaded the kids and Justin rode down the path for me. The kids climbed in again and I had to re-adjust because my daughter was now sitting on the left side instead of the right. The set off was a little hairy but in ten minutes, I re-adjusted to the weight. The Urban Arrow has a very low centre of gravity similar to the Nihola. However, with the kids in it, it feels heavier and sturdier but faster. Why? Because of its two wheels. On the Nihola, I am accustomed to the trade-off of stability, that a tricycle provides, for speed. 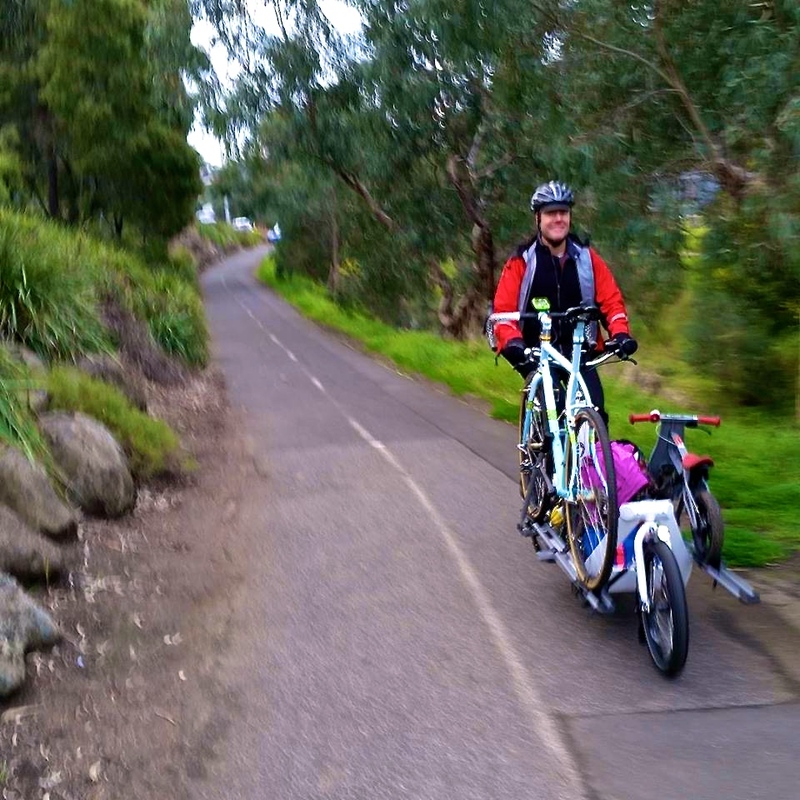 On the Urban Arrow, I mastered shifting to a “lower gear” to set-off and to ascend hills. Also, I switched from the “Turbo” setting, which gave me maximum power, to the “Touring” setting to conserve power for our return journey. Some areas of the bicycle path were steep and I easily ascended these in Turbo and a lower gear via the NuVinci gear shift. However, I would later tell Sean at Spokes that in very steep climbs with the kids in Turbo and a lower gear, the power would cut out and I would have a moment of panic. The power would resume again but it was a little scary. Earlier, when we set off from the grocery store, I hadn’t inserted the Bosch motor display properly onto its mount. It’s important to slide this Bosch display into its mount properly to engage the motor. 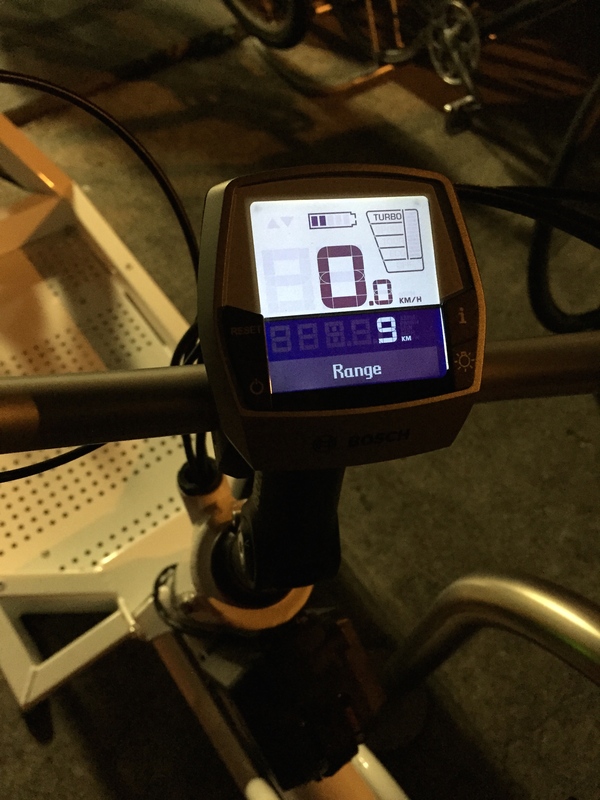 I rode the Urban Arrow without power on a flat. My progress was slow and I couldn’t hear the motor. I stopped and re-inserted the display after I noticed that my speed wasn’t registering. Unfortunately, the final long ascent up a hill at Boeing Reserve was impossible to climb with the kids. It was too long of a climb, the kids were very heavy and the power kept cutting out. The kids walked with Stephen and met me at the top. Because we couldn’t find the entrance to the course, we parked and locked at the bottom of the hill and walked up with gear, kids and bicycles. The Urban Arrows wait patiently to take us back to Fitzroy North. Justin and I were pleased at how well organised and attended the race was with many people from other states. We found a spot amid bales of hay to drop our things. We gave the kids some lunch. Soon it was time for the kids races. Justin went to try the course. We had anticipated that it would be muddy because of the rain earlier in the week. We were all wearing gumboots and had brought along our trainers and clip-ins. Attaching numbers and changing shoes. It’s nearly showtime! The kids put on their trainers and lined up for their races. Julius won the balance bike race! He was so far ahead of the other kids that he started calling for me. He was overwhelmed with the noise and people. So much so that I had to run around the course with him. I sprinted at the end to encourage him to finish as fast as he could. Fortunately, he outpaced me and I could stop running in my gumboots. The winner is holding an apple and won a $50 gift certificate to a bicycle store! Ofelia won the girls race which was wonderful! 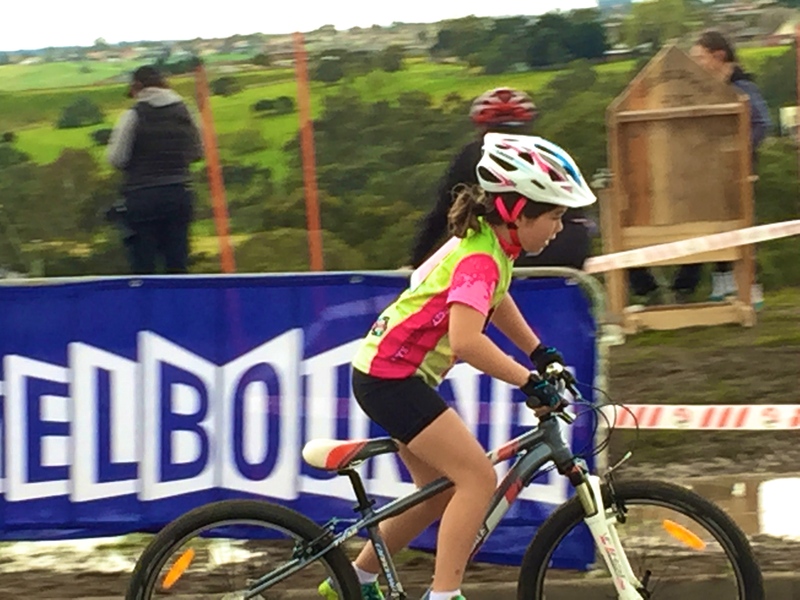 She went on a mountain biking course with Justin during the last school holidays and her progress and confidence were in evidence. She told me later that some of the boys had tried to push her out of the way during the race. This was par for the course. At the last race in Sydney, a boy pushed her off the course and she fell. She retaliated by getting in front of him later and angled her back wheel into his front wheel. He went down. (Justin taught her this. I’m glad.) His mother tried to tell her off after the race. Ofelia explained that he had knocked her down first. The mother went quiet. My brave and lovely girl who goes for it! Then the Masters Men’s race started. Justin fell twice at the bottom of the course. The entire crowd reacted “Ooooh!” Later, he realised that he had bruised his ribs. He was last but we were both so pleased that he finished. At cyclocross, it’s customary to ring cow bells to encourage the riders. Julius and I did so while Ofelia went to the pump track to practice. And clang we did while Justin was on the course. He told me later that he could hear our bell from the bottom of the hill. 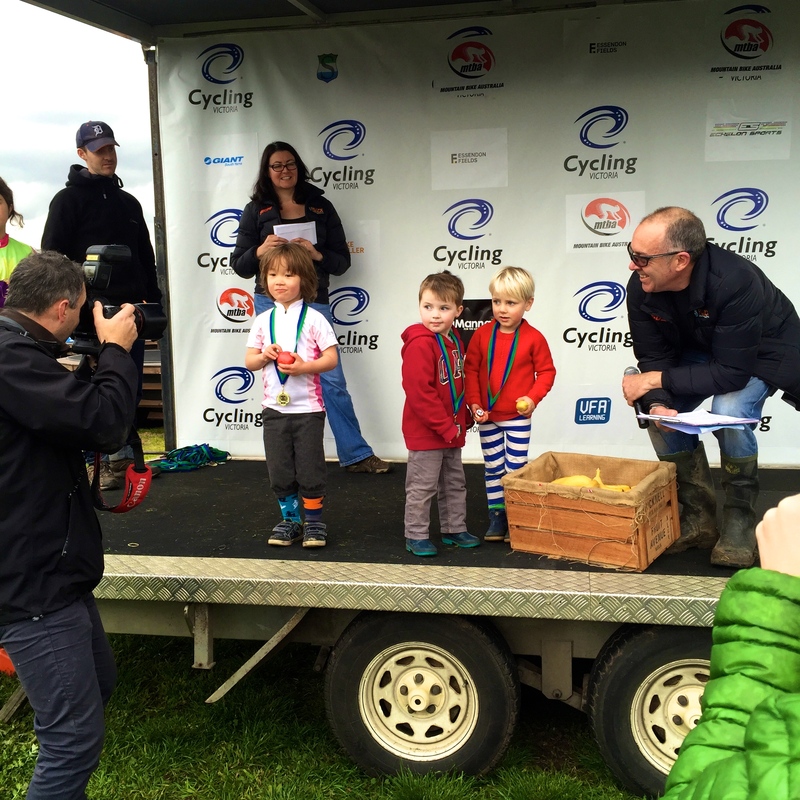 When I tried cyclocross last year, it was wonderful to have two little voices and Justin’s voice cheering me on. And then it was over and time to go. We were all intact. Justin had some blood, bruises and torn kit but was able to ride. The kids were fine without injury. They both fell while on the pump track but nothing serious that a cuddle couldn’t cure. Ofelia wanted to ride back on her bicycle. My load was easier as a result. We left the same way that we had come with bicycles, bags and kids. Stephen had enjoyed the afternoon too. Cyclocross races always have a great atmosphere. We were hoping to inspire him. Justin has met a lovely community of people as a result. We thought it might be the same for Stephen in Melbourne. Space on the Urban Arrow appeared for Julius’ balance bike to have it’s own mount. 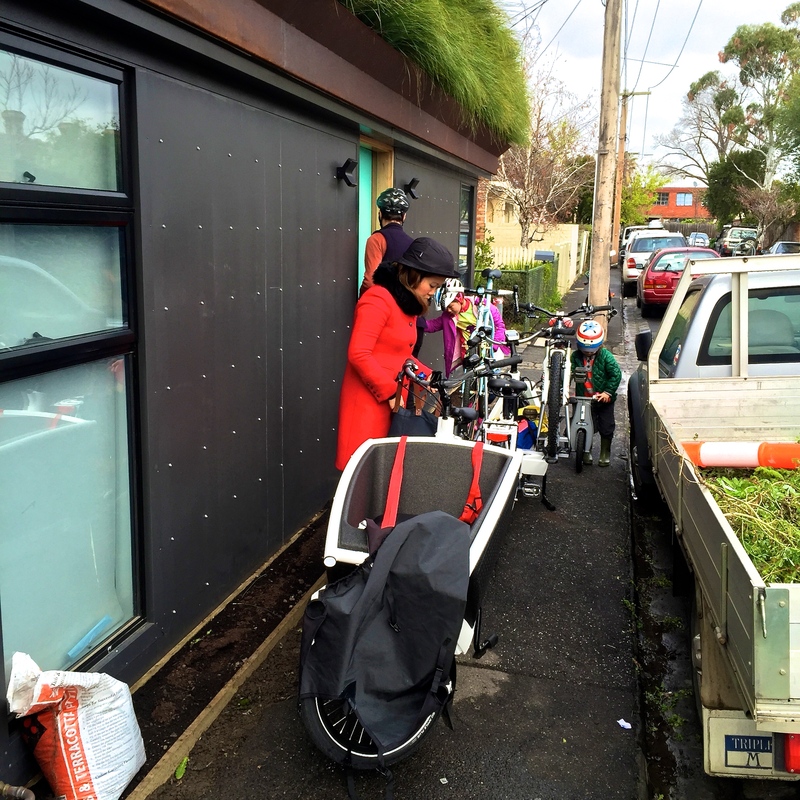 Ofelia wanted to ride back to Fitzroy North. Julius wanted Justin to put his balance Bike on the Urban Arrow-Bikes. We kept feeding the kids on the way home. As we went to our house, I was struck by the giant overpasses above us which were full of cars and stressed people. Enjoying the peace and tranquility while above cars and stress. We followed the ponds as they meandered through Melbourne’s suburbs, had a fabulous dinner at Pinotta and slept deeply that night. Ofelia: J.Crew jacket, jeans, jumper, Big W gumboots, Pearl Izumi kids short, Rocky Mountain Rags cycling jersey, Giro gloves, Limar helmet, Cannondale mountain bike. 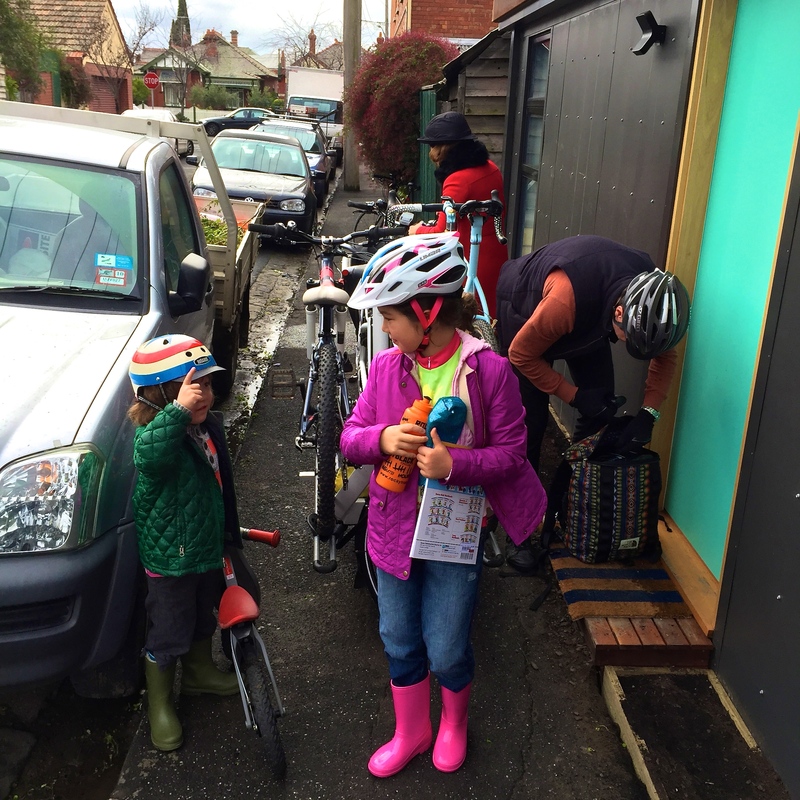 Julius: Gapkids jacket and jumper, Pearl Izumi jersey, woolen shorts, Country Road gumboots, Nutcase helmet, Aldi ski socks. I only have one bike, and it transports itself whenever I go anywhere (well, sort of). But I almost want one of those ‘bike trucks’ just because they are such magnificent pieces of engineering! I hope Justin is OK now! How far is it from Fitzroy to Fields of Joy, out of interest?